When a Doctor Who fan created his own unofficial title sequence for the show and put it on YouTube, the producers saw it and liked it so much that they decided to use it for the new series, which begins on BBC One on Saturday. It is probably the most hotly anticipated moment of the year on British television - the first episode of the new series of Doctor Who and the first proper appearance of Peter Capaldi as the Time Lord. A few minutes into the show, the iconic music will start up and the new opening titles will kick in. Those titles have been created by 46-year-old Billy Hanshaw from Leeds, who originally made the sequence simply to show off his graphics skills. What happened next was the ultimate dream for any Doctor Who fan. "Hanshaw created this title sequence, put it up on YouTube," Doctor Who executive producer Steven Moffat explained at a recent fan event in New York. "I happened across it, and it was the only new title idea I'd seen since 1963. We got in touch with him, and said, 'OK, we're going to do that one.'" Mr Hanshaw thought it was "a wind-up" when Moffat's fellow executive producer Brian Minchin got in touch. "I had to pinch myself because I didn't know if it was really happening," he says. "It's one of those stories about people putting something on YouTube - it's usually a musician this happens to. They put a performance on there and they get picked up by a label. "It's a similar kind of story. I thought, these things don't generally happen." Mr Hanshaw is a professional motion graphic designer who normally creates TV adverts and corporate presentations in his small home studio. He made the Doctor Who sequence, he says, to show clients what else he could do and because, eventually, he hoped to move into TV and film. In the past, the opening titles have taken viewers on a high-speed flight through space. In recent years, we have followed the Tardis as it hurtled down a wormhole through a terrifying maelstrom of psychedelic cloud, fire and debris. Mr Hanshaw's big idea was to hurtle through time instead of space. In his YouTube video, the viewer is taken through the cogs of the Doctor's pocket watch before the Tardis is spat out of the centre of an MC Escher-inspired spiralling infinite clock face. "The doctor is a Time Lord, he's not a Space Lord," Mr Hanshaw reasons. "A lot of people have said that cogs and clocks are an obvious metaphor to use. But if it's so obvious, why hasn't it be done before?" Mr Hanshaw got the idea after going to an exhibition by Escher, the Dutch artist who created optical illusions by depicting objects that look realistic on first glance, but are actually impossible and surreal. For the clock face, Mr Hanshaw deployed the "droste effect", in which objects recur infinitely within each other. "I think Escher had something to do with how that's calculated," Mr Hanshaw says. "That was one of the start points." The video clocked up 60,000 views in its first weekend on YouTube. It is now up to about 885,000. After being contacted by the big cheeses of the BBC, Mr Hanshaw has worked with the show's producers to tweak his original idea and create the final titles, which will be seen on Saturday. 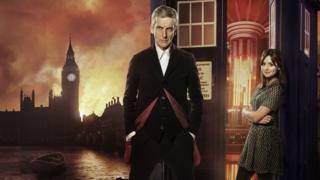 The finished version keeps the same idea as his original concept, with a few elements added by the BBC visual effects team. "There's a genius stroke that they've pulled," Mr Hanshaw says. "I can't tell you what it is, but it gets me every time I've seen it. It's wonderful and it's a little diversion from what I've done, but it works so beautifully." Mr Hanshaw began watching Doctor Who when Jon Pertwee, the third Doctor, was occupying the Tardis in the early 1970s. His favourite Time Lord was Pertwee's successor Tom Baker - although that may change after watching Capaldi, he says. Mr Hanshaw's design career started in the Sylvester McCoy era in the 1980s. He worked in brand design and advertising, helping to create packaging and campaigns for the likes of Asda, Nestle and Pepsi. After moving into website design, he decided to move into graphic animation and set up as a freelance animator. "I've spent most of my career being an ideas person," he says. "I've worked in advertising and branding and done some fairly large branding projects and you kind of have to think laterally about how you approach a design project. "Doing motion graphics is no different, apart from the fact that you create a narrative that's a little bit more engaging." After being handed his big break by Doctor Who, Mr Hanshaw is hoping to make a permanent leap into the world TV and film. "It's the biggest opening of a door you could possibly imagine," he says.